Becomes a Pupil of Saadia. Founder of New Hebrew Meter. Results of His Quarrel with Menahem. Philologist and poet of the tenth century. For the name "Dunash," which Joseph Ḳimḥi on one occasion ("Sefer ha-Galui," p.62), for the sake of the rime, writes ("Dunosh"), see Dunash Ibn Tamim. "Labraṭ" ( , generally written without ) does not occur elsewhere as a given name; hence "Ben Labraṭ" may be the family name. "Labraṭ" has been explained as "Laurat" (Steinschneider, "Jew. Quart. Rev." xiv. 130) and as "Librat," "Librado" (Derenbourg, "Opuscules," p.2). Both of Dunash's names, therefore, are of Romance origin. Abraham ibn Ezra Hebraizes "Dunash" into "Adonim"; Dunash himself employed the Biblical name "Adonijah," which is a mnemonic device containing the servile letters ("Criticism of Saadia," No. 6). Dunash was of Levitical descent (Moses ibn Ezra calls him "Al-Levi"), and to this origin also his pupil Jehudi b. Sheshet dedicated a few panegyric verses (Polemic Treatise, verses 10-16). Dunash's family came originally from Bagdad, although he himself was born in Fez (Moses ibn Ezra). While still young, though doubtless equipped with a rich fund of knowledge, Dunash, perhaps influenced by the origin of his family, journeyed eastward and became a pupil of the renowned gaon of Sura, Saadia, whom, in his tract against Menahem b. Saruḳ, he proudly designates as his master. The term employed by Dunash in this connection ( , verse 101; the pupils of Menahem more clearly expressed it as , p. 48) is responsible for the singular belief that Dunash was a grandson of Saadia; but the pupils of Menahem (p. 27) expressly designate him as the "least important of the pupils of Saadia." Dunash himself relates that he submitted his Hebrew verses, containing the first application of an Arabic meter, to the gaon, who expressed his astonishment at this innovation in the words, "Such a thing has hitherto been unknown in Israel." Dunash was, therefore, still very young when he adapted the Arabic meter to Hebrew poetry. 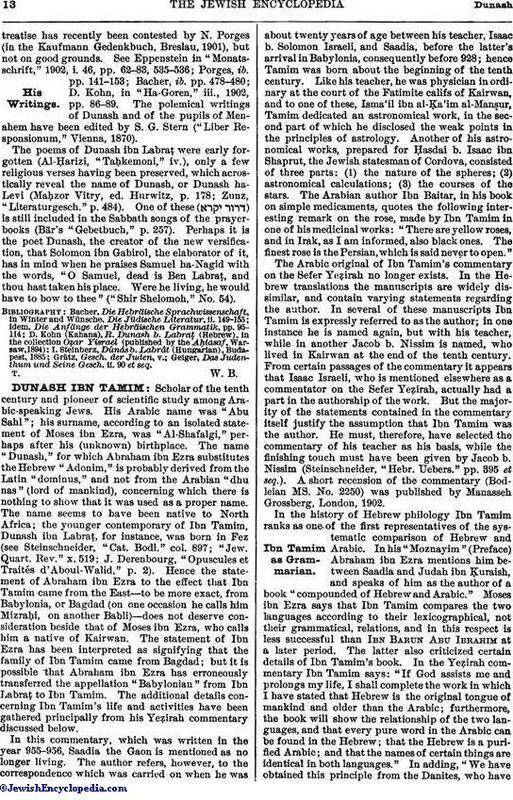 This innovation created a new epoch for Hebrew poetry, and was probably inspired in North Africa, where Ibn Ḳuraish and Dunash ibn Tamim prepared the way for a systematic comparison of the Hebrew and Arabic—a comparison to which Ibn Labraṭ afterward gave his indorsement in his tract against Menahem. It may be accepted as a historical fact that Dunash was the founder of the new Hebrew meter. He is as such regarded byhis opponents, the pupils of Menahem, who objected to the innovation on the ground of its inappropriateness, although they themselves follow the example of Dunash by writing metrical verse. Dunash is celebrated as an innovator by his pupil Jehudi b. Sheshet, who, referring to his work, says: "He created a new foundation for our poetry, such as did not exist in the days of our fathers." Another observation which this scholar makes would seem to indicate that Dunash did not hesitate to put forward his convictions even when they clashed with those of Saadia. After the death of Saadia (942) Dunash returned to Fez, and thence went to Cordova, which city, under the powerful influence of the statesman Ḥasdai ibn Shaprut, was rapidly becoming a center of culture among the Jews of Spain. Of the circumstances of Dunash's life nothing further is known. He seems, however, to have been a man of means. Dunash soon found an opportunity for applying his knowledge, his critical acumen, and his literary talents to a matter of consequence. The first important product of Jewish literature in Spain had appeared—the Hebrew lexicon of Menahem b. Saruḳ. Dunash wrote an exhaustive criticism of it, composed partly in the metrical verse introduced by him, and dedicated this comprehensive and logically elaborated polemical treatise to Ḥasdai ibn Shaprut, Menahem's patron. In the opening verses Dunash proclaims the fame of this statesman, whose services in the cause of his prince and of his coreligionists were alike eminent. This dedication was skilfully interwoven with a tribute to the great diplomatic successes which Ḥasdai had shortly before obtained (in 960); namely, the acquisition of the ten fortresses, and the journey of the son of Ramiro and his grandmother Tota to pay homage at the court of the califs of Cordova (Dozy, "Histoire des Musulmans d'Espagne," ii. 54 et seq.). The flattery of Dunash impressed Ḥasdai powerfully; and his attacks on Menahem lowered the latter in the estimation of his patron. 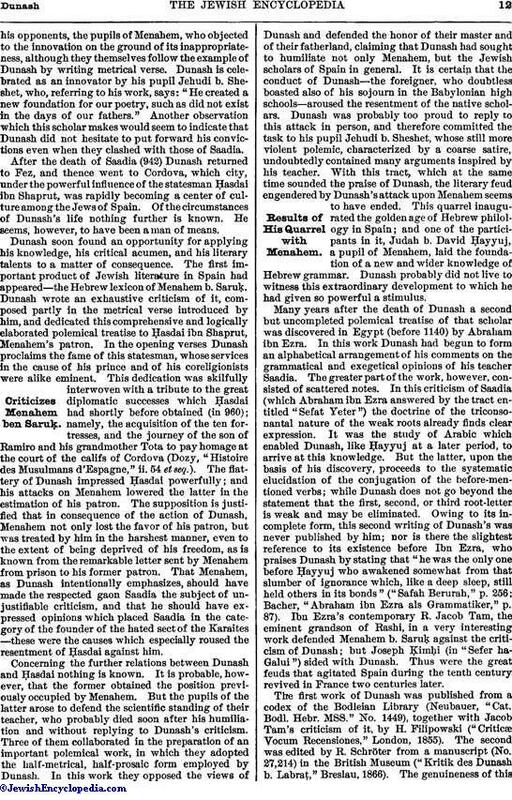 The supposition is justified that in consequence of the action of Dunash, Menahem not only lost the favor of his patron, but was treated by him in the harshest manner, even to the extent of being deprived of his freedom, as is known from the remarkable letter sent by Menahem from prison to his former patron. That Menahem, as Dunash intentionally emphasizes, should have made the respected gaon Saadia the subject of unjustifiable criticism, and that he should have expressed opinions which placed Saadia in the category of the founder of the hated sect of the Karaites—these were the causes which especially roused the resentment of Ḥasdai against him. Concerning the further relations between Dunash and Ḥasdai nothing is known. It is probable, however, that the former obtained the position previously occupied by Menahem. But the pupils of the latter arose to defend the scientific standing of their teacher, who probably died soon after his humiliation and without replying to Dunash's criticism. Three of them collaborated in the preparation of an important polemical work, in which they adopted the half-metrical, half-prosaic form employed by Dunash. In this work they opposed the views of Dunash and defended the honor of their master and of their fatherland, claiming that Dunash had sought to humiliate not only Menahem, but the Jewish scholars of Spain in general. It is certain that the conduct of Dunash—the foreigner, who doubtless boasted also of his sojourn in the Babylonian high schools—aroused the resentment of the native scholars. Dunash was probably too proud to reply to this attack in person, and therefore committed the task to his pupil Jehudi b. Sheshet, whose still more violent polemic, characterized by a coarse satire, undoubtedly contained many arguments inspired by his teacher. With this tract, which at the same time sounded the praise of Dunash, the literary feud engendered by Dunash's attack upon Menahem seems to have ended. This quarrel inaugurated the golden age of Hebrew philology in Spain; and one of the participants in it, Judah b. David Ḥayyuj, a pupil of Menahem, laid the foundation of a new and wider knowledge of Hebrew grammar. Dunash probably did not live to witness this extraordinary development to which he had given so powerful a stimulus. Many years after the death of Dunash a second but uncompleted polemical treatise of that scholar was discovered in Egypt (before 1140) by Abraham ibn Ezra. In this work Dunash had begun to form an alphabetical arrangement of his comments on the grammatical and exegetical opinions of his teacher Saadia. The greater part of the work, however, consisted of scattered notes. In this criticism of Saadia (which Abraham ibn Ezra answered by the tract entitled "Sefat Yeter") the doctrine of the triconsonantal nature of the weak roots already finds clear expression. It was the study of Arabic which enabled Dunash, like Ḥayyuj at a later period, to arrive at this knowledge. But the latter, upon the basis of his discovery, proceeds to the systematic elucidation of the conjugation of the before-mentioned verbs; while Dunash does not go beyond the statement that the first, second, or third root-letter is weak and may be eliminated. Owing to its incomplete form, this second writing of Dunash's was never published by him; nor is there the slightest reference to its existence before Ibn Ezra, who praises Dunash by stating that "he was the only one before Ḥayyuj who awakened somewhat from that slumber of ignorance which, like a deep sleep, still held others in its bonds" ("Safah Berurah," p. 256; Bacher, "Abraham ibn Ezra als Grammatiker," p. 87). Ibn Ezra's contemporary R. Jacob Tam, the eminent grandson of Rashi, in a very interesting work defended Menahem b. Saruḳ against the criticism of Dunash; but Joseph Ḳimḥi (in "Sefer ha-Galui") sided with Dunash. Thus were the great feuds that agitated Spain during the tenth century revived in France two centuries later. The first work of Dunash was published from a codex of the Bodleian Library (Neubauer, "Cat. Bodl. Hebr. MSS." No. 1449), together with Jacob Tam's criticism of it, by H. Filipowski ("Criticæ Vocum Recensiones," London, 1855). The second was edited by R. Schröter from a manuscript (No. 27,214) in the British Museum ("Kritik des Dunash b. Labraṭ," Breslau, 1866). The genuineness of thistreatise has recently been contested by N. Porges (in the Kaufmann Gedenkbuch, Breslau, 1901), but not on good grounds. See Eppenstein in Monatsschrift," 1902, i. 46, pp. 62-83, 535-536; Porges, ib. pp. 141-153; Bacher, ib. pp. 478-480; D. Kohn, in "Ha-Goren," iii., 1902, pp. 86-89. 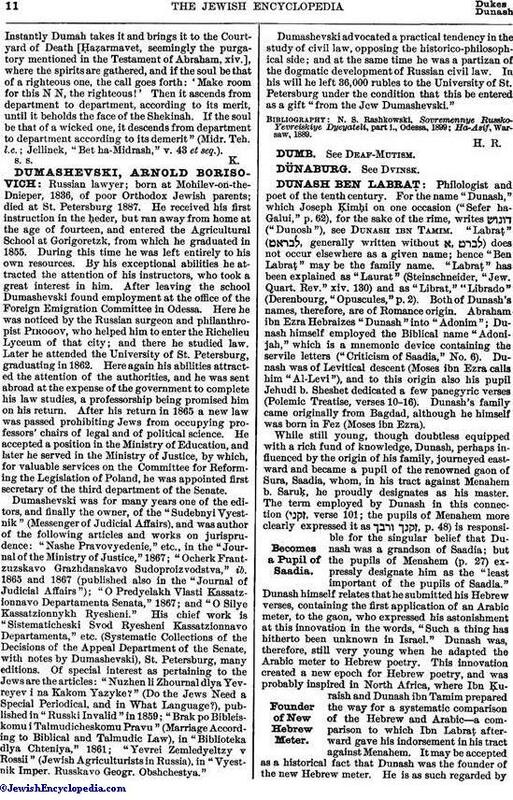 The polemical writings of Dunash and of the pupils of Menahem have been edited by S. G. Stern ("Liber Responsionum," Vienna, 1870). The poems of Dunash ibn Labraṭ were early forgotten (Al-Ḥarizi, "Taḥkemoni," iv. ), only a few religious verses having been preserved, which acrostically reveal the name of Dunash, or Dunash ha-Levi (Maḥzor Vitry, ed. Hurwitz, p. 178; Zunz, "Literaturgesch." p. 484). One of these ( ) is still included in the Sabbath songs of the prayer-books (Bär's "Gebetbuch," p. 257). Perhaps it is the poet Dunash, the creator of the new versification, that Solomon ibn Gabirol, the elaborator of it, has in mind when he praises Samuel ha-Nagid with the words, "O Samuel, dead is Ben Labraṭ and thou hast taken his place. Were he living, he would have to bow to thee" ("Shir Shelomoh," No. 54). Geiger, Das Judenthum und Seine Gesch. ii. 90 et seq.